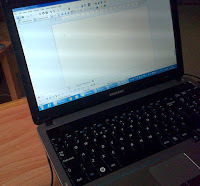 This week I want to introduce you to yWriter software, which I use to write all my books. It’s free software, created by a writer, which helps you to outline and write your novel. It’s produced by Spacejock Software, and available here. If you're just embarking on your first novel a program like yWriter may seem like overkill. I mean, all you have to do is type everything into a word processor! Sure, but wait until you hit 20,000 words, with missing scenes and chapters, notes all over your desk, characters and locations and plot points you've just added and which need to be referenced earlier ... it becomes a real struggle. Now imagine that same novel at 40,000 or 80,000 words! No wonder most first-time writers give up. I say:It’s a great way to organise writing your novel. You begin by setting up chapters, and scenes within each chapter. Each scene has a title, point of view character, and a description. This is the detail of your outline. Then you write the contents of each scene. It’s simple to rearrange the work – you just drag scenes into other chapters, or create new scenes or chapters. There is also the facility to analyse elements of each scene. A separate tab records whether the scene is action or reaction, plot or subplot, timings and status (Outline, draft, 1st edit, 2nd edit or done). Of course, it takes more than two or three edits to polish a novel, but it does help to keep track of how much work you’ve done on different scenes. You can also list and describe characters, objects and places, which get linked into the scenes in which they appear. This helps you keep track of them and you can easily look up the details if you forget whether someone’s eyes are supposed to be brown or blue. There are various reports to enable you to list just headings, descriptions or the whole contents to work on, and to transfer the novel to Word or whatever word processor you use. It’s easy to use and it’s free. What more could you want? Sorry, you have to supply the inspiration.